The Nevada Tigers eighth-grade A-team dealt Fort Scott Middle School a 32-23 loss, Tuesday night in Fort Scott. The Tigers are now 2-0. 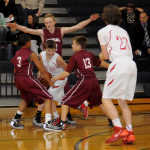 The NMS eighth-grade B-team also prevailed at Fort Scott, picking up a 36-30 win, to move to 1-1.